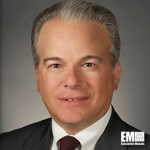 Bernie Guerry, an 11-year veteran of General Dynamics (NYSE: GD), has been promoted to chief operating officer of the Falls Church, Virginia-based defense contractor’s information technology division. He will directly report to Amy Gilliland, president of General Dynamics Information Technology, and continue to serve as senior vice president and general manager of GDIT’s intelligence business, the company said Tuesday. Gilliland said Guerry’s more than 25 years of leadership experience would help advance growth strategies within the company’s IT division. Guerry is a former member of the Intelligence Community Acquisition Council and previously served on the Office of Management and Budget’s Federal Acquisition Council.